The Virginia Scottish Games is a unique annual festival that began as a celebration of Alexandria's Scottish Heritage and continues to celebrate the Scottish Heritage of the whole Commonwealth of Virginia. The cornerstone of the event is the Highland Athletic Competition. From the days of the medieval Scottish kings, Highland athletes have gathered to test their strength on the field of honor. The Games will host many of the top-ranked professional athletes in North America to include several who have competed at the recent World Championships. 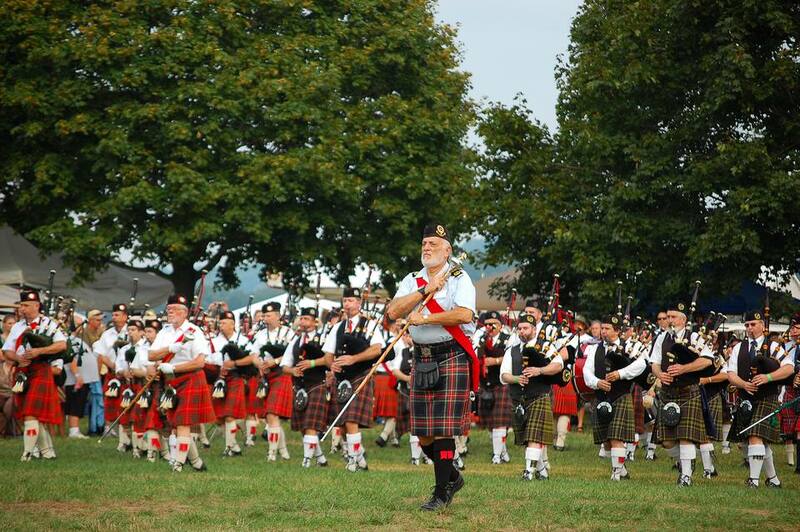 In addition to athletic competitions, the Virginia Scottish Games includes piping & drumming, highland dancing, and fiddling competitions along with sheep-herding demonstrations, an antique car show, a variety of vendors & crafters, clan and society exhibits, a living history encampment, children's activities, live entertainment and plenty of Scottish food and drink. Great Meadow, 5089 Old Tavern Rd. The Plains, VA.
Take I-66 W to Exit 31 for VA-245, turn left on to 245 S. Follow to signs to the park. Great Meadow Field Events Center is 1 mile on left. Gate #1 is main entrance. Great Meadow is a 200-acre equestrian and event facility located an hour west of Washington DC. Braemar Stone Toss - Named for the ancient festival held in Braemar, Scotland, the event requires that a heavy stone be put from a standing position. The stone, weighing between 22 and 28 pounds, is thrown from standing. Both feet must remain stationary until the stone is released. Open Stone Toss - The "clachneart," or stone toss, is one of the world's most ancient tests of strength to see who can throw a sizeable creek stone the farthest. The event allows a run-up or spinning approach, with the stone usually weighing between 16 and 18 pounds. Light Weight Toss - The track and field 35 lb. weight throw is derived from Highland Games weight tosses. The contestant must keep at least one foot within the sidelines of the 4'6" wide and 9' deep throwing box at all times. Heavy Hammer Throw - Throwing the massive rock quarryman's hammer is a test of strength developed hundreds of years ago. The athletes will throw the hammer with their feet remaining stationary, aided by metal spikes that are mounted to the bottoms of their boots and jammed into the ground. Caber Toss – This is the only event that isn't measured for height or distance. Instead, judges score the event in a subjective manner. A perfect score occurs when an athlete is able to turn the caber end-over-end, with the caber landing in line with the athlete's direction of momentum. Sheaf Toss - Using a traditional 3-tyne hay fork, the athlete attempts to throw a burlap bag stuffed with materials such as straw or bailing twine over a horizontal bar. Weight Over Bar - Originating from similar traditions as the weights tossed for distance, this is a staple event that is also often contested in strongman contests. The rules are minimal, simply stand under a horizontal bar and throw a 56 lb. weight over it with one hand.